I had a college professor who used to talk on and on about intertextuality and how that concept could be applied to life. According to him, and probably Jean-Paul Sartre, every waking second impacts and influences our future in one form or another. It makes sense when you think about it. And a perfect example of it is this lovely four bedroom, 4½-bath home in Talis Park. Completed last year, it represents the tastes of style of its owners, Rafael and Lillian Guaty, who spent years working and living in Tokyo and Hong Kong. If you’re looking for a dramatic entrance, you’ll be hard-pressed to find something more engaging than the one at this 4,800-square-foot under air (6,000 total under roof) property built by Harwick Homes and designed by McHarris Planning & Design. To accomplish their goal and create the perfect space, they enlisted the help of Mark Smith, president of luxury homebuilder Harwick Homes. Mr. Smith had started the design of a spec home with Joe McHarris of McHarris Planning & Design that made water a major feature viewable from the great room. When Mr. Guaty saw the plan, he suggested they move the water feature to make it a focal point from the foyer — and they were off to the races. And after what all parties enthusiastically call an enjoyable collaboration, the finished product is a gorgeous creation that subtly reminds the homeowners of their time in Asia. 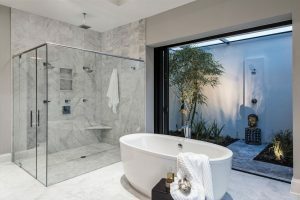 Though the homeowners’ time in Southeast Asia is reflected throughout the home, perhaps it is best showcased in the master bath, which features an open-air shower and sculptural soaking tub. In fact, perhaps nowhere is that more evident than in the master bath, where the Guatys wanted more of that in-and-out look that is so prevalent in the East. And the glass doors are retractable into the wall, really giving a sense of being one with nature. There’s even a bamboo tree growing in the shower. A free-standing tub rests alongside those sliders, so when the doors are open, it’s as if you’re in the bath outdoors. In addition, the Guatys knew they didn’t want a formal living room — they’d had them before in the majority of their 22 previous homes (correct, they moved a lot) and felt they were a waste of space. 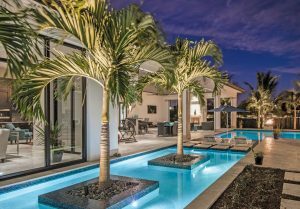 The dramatic pool area features in-water palm trees that are not only stunning, but an entertaining distraction for the homeowners’ grandchildren. The water surrounding the trees is just 18 inches deep. To take full advantage of seeing as much of the outside as possible from inside, they chose commercial floor-to-ceiling windows that allow for an unobstructed view of that pool area with its palm trees. “I think this is the first time Harwick used them in a home,” says Mr. Guaty. “And to be honest with you, it’s one of those things where you kind of hold your breath. Because I know the look, but I didn’t want it to look like we’re coming into a 7-Eleven. Another highlight that features clean lines is the contemporary wine cellar. Again utilizing a commercial-style glass door, the refrigerated room uses stainless steel racks, making it a veritable work of art. And speaking of art, the interior design was handled completely by Mrs. Gauty and features a refined edit of spaces that allow perfectly for the couple’s Asian art pieces to be on display. It’s a lovely blend of watercolors that dance ideally with the outdoor area. “The Asian experience overseas really filtered our likes toward the clean lines look,” Mr. Guaty says. “Symmetry was important. Clean lines. That was the goal.